Ok look…I’m not gonna talk about politics (right now.) But we have to discuss this picture. First let me say this. I have a lot of friends and acquaintances that aren’t Christians. And all them know that me and Jesus are BFFs. Therefore, I have to answer to all these people for all the stupid stuff my Christian brethren decide to post on social media. And can I just say that ya’ll are posting a lot of crap that I cannot even explain, much less defend? 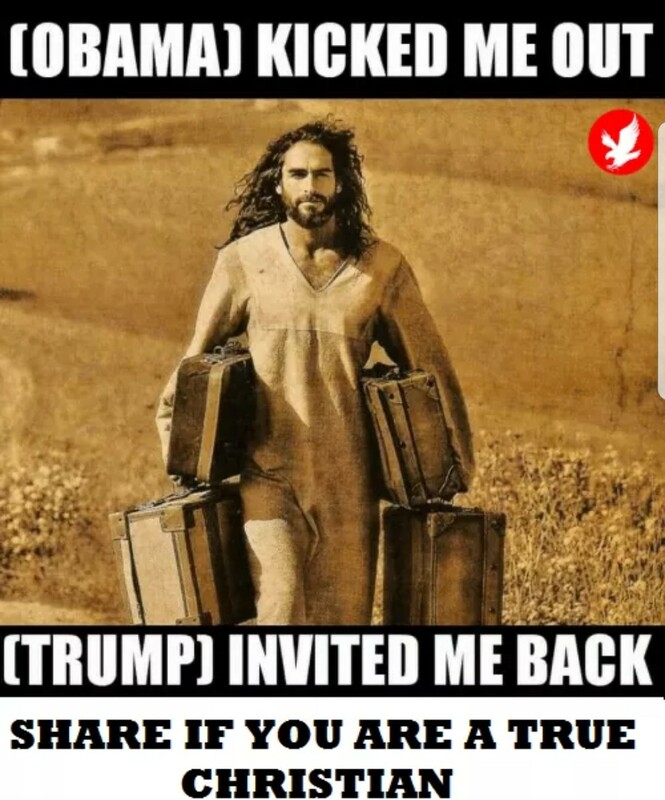 WHY WOULD JESUS NEED 4 SUITCASES??????? Jesus was basically a homeless preacher. I can’t prove it biblically but I’d be shocked to find out he owned more than one pair of sandals. The Bible makes a big ole deal about his seamless robe which leads me to believe he probably didn’t have a closet full of them. So assume the literal KING OF KINGS could be ‘kicked out’ by some American President (spoiler alert : he can’t be). I’m pretty sure he wouldn’t need to pack up four pieces of luggage to make the trip. And sure, I get what my aunt was trying to convey with this post but we’ve got to do a better job folks. True Christians need to be about the work God has given us and that work is inviting people to discover Jesus. 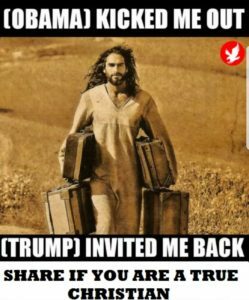 Our job is not to create weird a weird meme Jesus and then try to shame people into thinking they aren’t “True Christians” if they don’t share it. Actually I never left. I’ve just been bottling up all my thoughts and feelings for a long time now instead of blogging them. This was…a mistake. I think that knowing people were actually reading this thing gave me a bit of stage fright. I started to really care what people thought of me. This blog was always just supposed to be my musings and nonsense unfiltered by my need to impress anyone. And to that it must return. So if you read what I write, that’s great. I hope you like it. If you don’t, I suggest just starting your own blog. It can be cathartic. I’m going to attempt to remove the subscription option. So if I’m able to do that, you won’t get my posts delivered to your inbox anymore. Again, the idea that my goofy thoughts on Jesus, weight loss and sausage balls was crowding your inbox made me feel weird. Also I have a bunch of family memory type things I need to catch up on here and while I know most of you really like my kids, no one needs to be subjected to slideshows of them on a daily basis. I feel as if I have far too much to say. If I could string even 2 coherent thoughts together, I could write a book about politics, religion or 18th century English literature. But I can’t. So let’s talk about appetizers. Jesus is the reason for the season. No doubt. He’s first place. But sausage balls are definitely the first runner up. They are the perfect appetizer. Good hot or cold. Very portable. And they are only for Christmas. (You might be able to get away with making a batch for New Year’s Eve but don’t post pictures of it on Instagram.) No matter where you are invited for the holidays, you cannot go wrong with sausage balls. (Unless you are visiting people who don’t eat pork. I am a respecter of all religions and faiths but I just can’t conceive of a loving God that would keep me from sausage. Amen.) Usually your hostess will attack you at the door, whisk the container from your hands and start shoving the delicious morsels in her mouth while she drops your coats in the master bedroom. Once your popularity as ‘the bringer of the sausage balls’ grows, people will invite you to parties just for your delicious offering. This is a small price to spread joy to the world each holiday season. Trust me when I tell you this. Never make a single batch. I make one round to shove in the mouths of my husband and children to buy me enough time to make 2 more real quick and hide for later. Mix it together. This part is kind of a pain to be honest. But it can’t be helped. Don’t even think about using your Kitchen-aid mixer here. Some things in life are worth fighting for. Sausage balls are one of them. Once it’s all mixed together, form it into balls, throw it into a 375 degree oven and watch the magic happen. Cook them for about 20 minutes. You want them to be golden but not real brown. The key to this delectable concoction is it’s simplicity. Don’t be led astray by internet idiots (other than me) who will try to convince you that this recipe is somehow lacking. People do this nonsense all the time. I blame the Allrecipe website and the pervasive rampant narcissism in today’s culture. Every dang body thinks they can ‘improve’ on stuff if they give it their own special twist. To this I say “NO SIR!” This recipe doesn’t need a special cheese (not cream cheese, not cheez-whiz, not organic white cheddar made by Welsh coal miners), it doesn’t need grass fed chorizo and it does not need herbs and spices. I was raised to be a lady but if I attend a party and you bring sausage balls containing thyme, oregano or rosemary, I will fight you. I’m sorry but you’ve got to stand for something in this crazy world and no spices in sausage balls is the mountain I’ve chosen to die upon. Also, don’t try to make this deal harder than it has to be. I once heard a woman suggest that we make our own Bisquick. What blithering idgit would even come up with such an idea? What does your daily life look like that it includes enough free time to make your own Bisquick? This gal’s toilets better be sparkling and all her closets completely organized alphabetically is all I can say. I will mark ‘learn to tap dance’ and ‘re shingle my roof ‘ off my bucket list before making my own Bisquick. They even make a pre-made sausage balls now. You can find them in your freezer section. And by all means, get you some. Assuming you hate your family and the entire reason for the holidays of course. Before you even ask, let me admit that no, I have not tried them. Look, I’ve never tried ritualistic Satan worship either but I’m pretty sure it ain’t my cup of tea. But the bigger question you need to ask yourself here is “Am I really too busy to mix three ingredients in a bowl?” Because if the answer is yes? Well, I’m not trying to tell you how to live but I think you might be too dang busy. Friends, we live in a hard and scary world. Sausage balls will not fix that. But it might make you feel better for a few minutes and what more can we hope for in 2016?